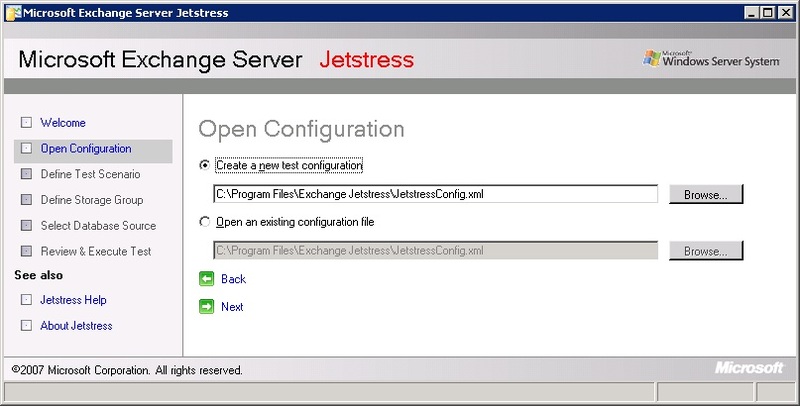 Now it's generally not recommended to run JetStress after Exchange has been installed, and in the case of this lab, JetStress results will be pretty much meaningless as I'll be adding more load to the same SAS disk that the Exchange database disk is on. However, in the interests of completeness, and to get a general idea of how performance currently stands I decided to put the setup through its paces. I don't want to be messing around with the thin provisioned disk the databases currently sit on, so I decided to add a additional disk with the same config as the current database disk, which I can delete once the test has been run. I then RDP'd to the Back-End server and initialised and brought online the disk. 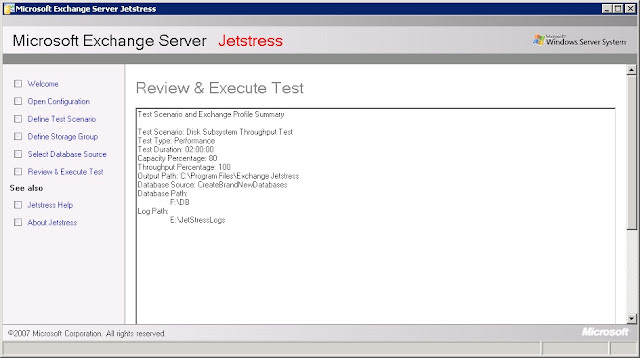 Next, I needed to download the 32-bit version of JetStress which can be obtained here. The installer is pretty much an next, next finish scenario. 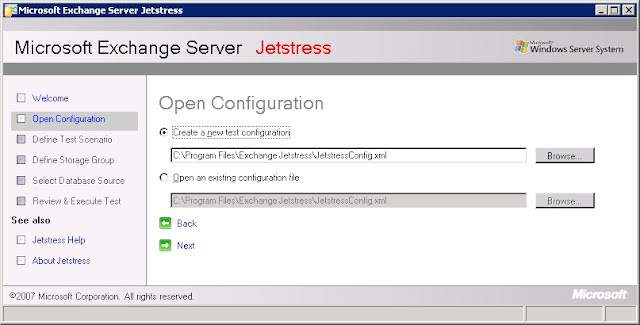 You also need to put a copy of the following four files in the JetStress directory, in this case as I already had Exchange installed, I could simply copy them from the Exchsrvr\bin directory, but you can also pull them off the Exchange install ISO. 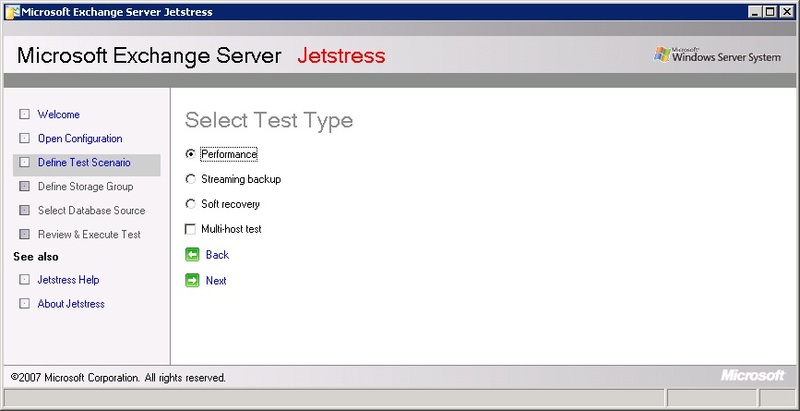 The first time you run JetStress, as the advanced performance counters aren't enabled, JetStress enables them and needs to be restarted. 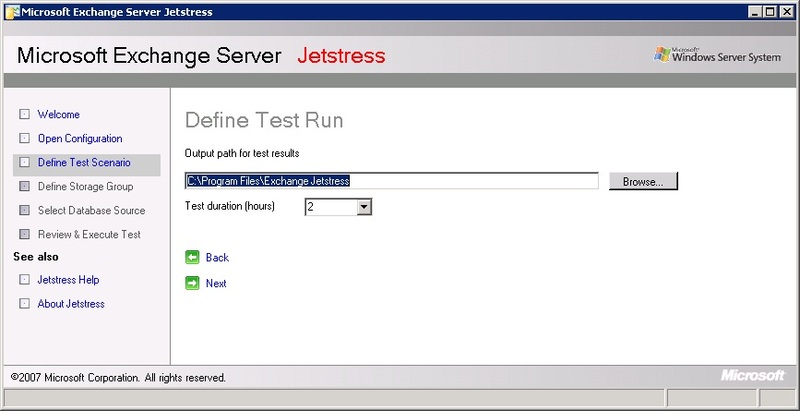 I don't have a defined test scenario, so I'll be creating a new one. 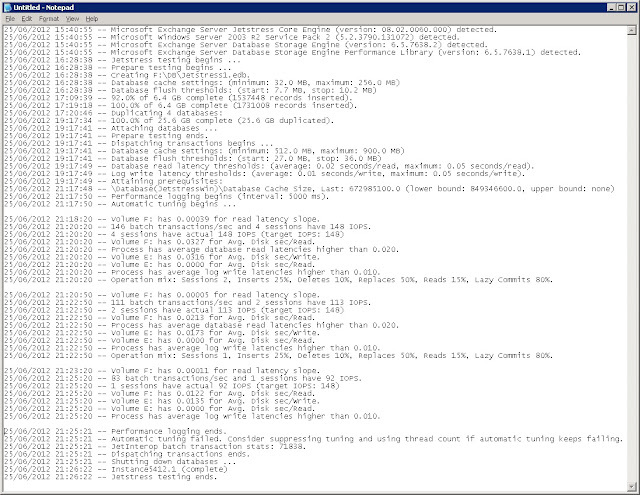 For now, I just want to test disk subsystem throughput. I capped the storage capacity percentage at 80% and left the target IOPS at 100. I'll be running a simple performance test here. I kept the output file for results at the default location, and set the test to run for two hours. 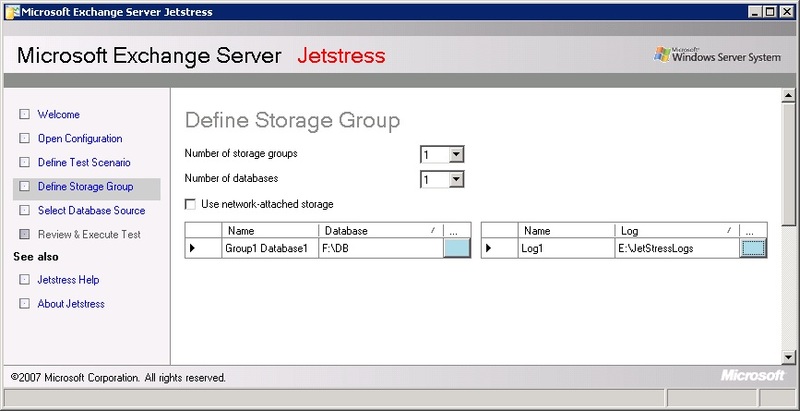 I'll just be simulating a single Storage Group and Database, and I pointed the database at the drive I added earlier. 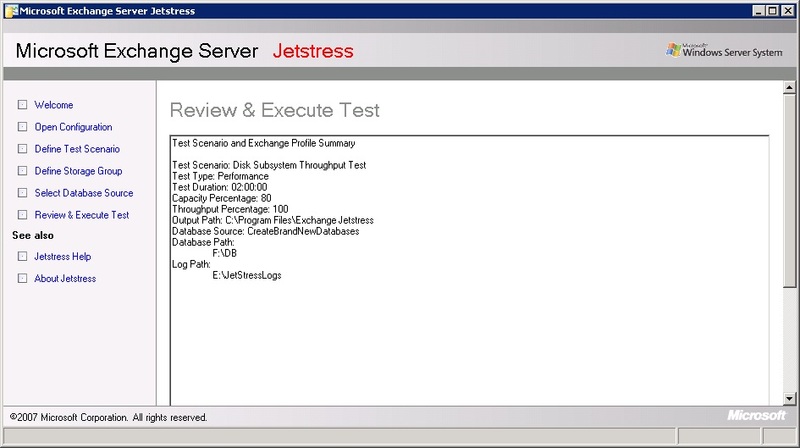 This version of Jetstress won't let you simulate logs and database on the same disk, despite the fact that this configuration can be set without problems in ESM. The fact there was no log and database on the same disk warning in ExBPA leads me to believe it's a supported configuration (it is for 2007 and 2010) and as long as you have been sizing and speccing your disks correctly there shouldn't really be an issue. (Although getting enough performance from this kind of setup would have been more difficult with the available hardware when Exchange 2003 was first released)... 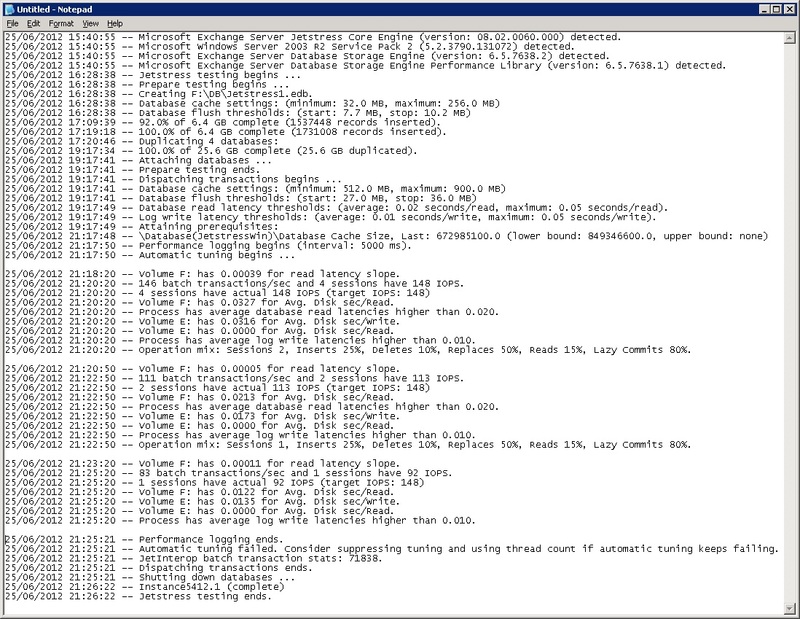 Anyway, I created a tempory logs folder on the existing data drive. This means the results will be somewhat removed from what I should expect with the actual live configuration, but should be somewhat similar to what I would get if I added an additional logs drive to the live system and moved the logs there. 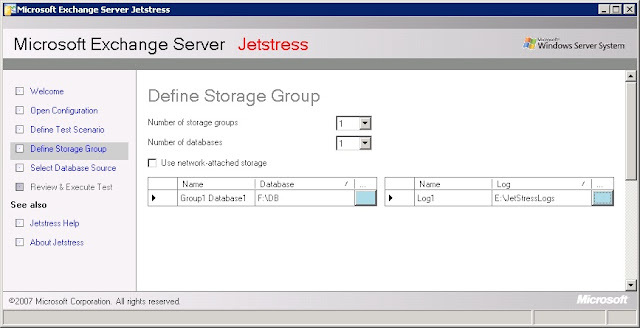 The final configuration option allows you to select a database source or create the database, I opted to create it, then you are presented with a summary of the options selected. After clicking execute test, the test begins. With the options selected the test tries multiple thread counts to try and achieve a pass. It didn't get one, but I wasn't really expecting it to, and in actuality, the latencies seen in the results aren't as bad as I thought they may be. For the types of load I'll generally be putting on the system I'm not expecting these numbers to cause a huge issue. 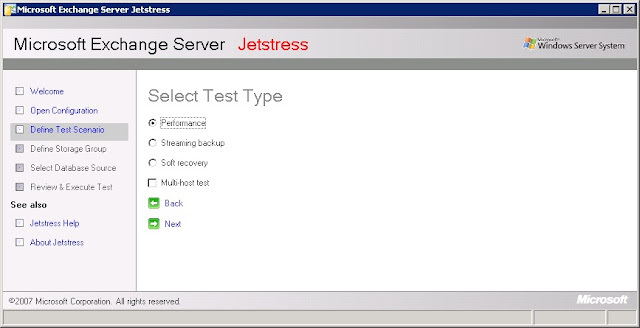 The result inside the JetStress window is in a text box of limited size, even when maximised, so I pasted it into notepad for easier reading. There's little point in me attempting to re-run the test with set thread counts - it's unlikely to make it pass, but as above, I'm not too worried about these numbers, the little client and OWA testing I've done so far has left me happy that the performance is adequate for the purposes of this lab, and the numbers above hint towards the possibility that I may be able to (perhaps with some minor design tweaks) get a pass for 2007 or 2010 (not that the lab needs to pass this validation - it's just a nice to have).